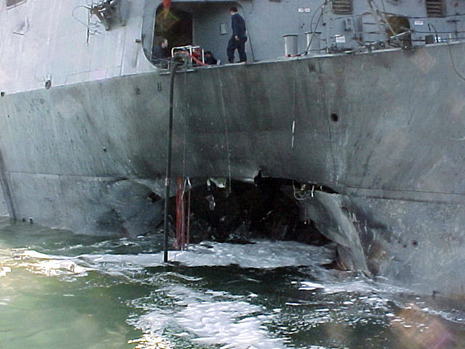 The USS Cole bombing was a suicide attack against the United States Navy destroyer USS Cole on October 12, 2000, while it was harbored and refueled in the Yemen port of Aden. Seventeen American sailors were killed, and 39 were injured. This event was the deadliest attack against a United States Naval vessel since 1987. The terrorist organization al-Qaeda claimed responsibility for the attack. A U.S. judge has held Sudan liable for the attack, while another has released over $13 million in Sudanese frozen assets to the relatives of those killed. The American Navy has reconsidered their rules of engagement in response to this attack. On the morning of Thursday, October 12, 2000, USS Cole, under the command of Commander Kirk Lippold, docked in Aden harbor for a routine fuel stop. Cole completed mooring at 09:30. Refueling started at 10:30. Around 11:18 local time (08:18 UTC), a small craft approached the port side of the destroyer, and an explosion occurred, creating a 40-by-40-foot gash in the ship's port side, according to the memorial plate to those who lost their lives. According to former CIA intelligence officer Robert Finke, the blast appeared to be caused by explosives molded into a shaped charge against the hull of the boat. Around 400 to 700 pounds (200–300 kg) of explosive were used. The blast hit the ship's galley, where crew were lining up for lunch. The crew fought flooding in the engineering spaces and had the damage under control after 3 days. Divers inspected the hull and determined that the keel was not damaged. 17 sailors were killed and 39 were injured in the blast. The injured sailors were taken to the United States Army's Landstuhl Regional Medical Center near Ramstein, Germany, and later, back to the United States. The attack was the deadliest against a U.S. Naval vessel since the Iraqi attack on the USS Stark on May 17, 1987. The asymmetric warfare attack was organized and directed by the terrorist organization al-Qaeda. In June 2001, an al-Qaeda recruitment video featuring Osama bin Laden boasted about the attack and encouraged similar attacks. 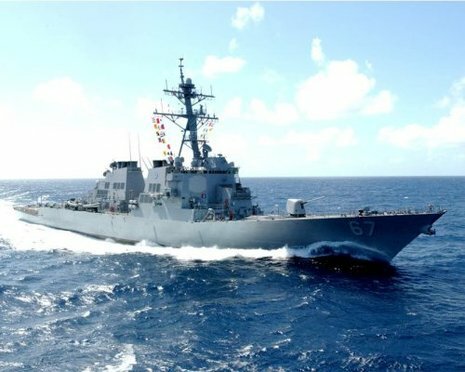 Al-Qaeda had previously attempted a similar but less publicized attack on the U.S. Navy destroyer USS The Sullivans while in port at Aden, Yemen, on January 3, 2000, as a part of the 2000 millennium attack plots. The plan was to load a boat full of explosives and explode near The Sullivans. However the boat was so overladen that it sank, forcing the attack to be abandoned. Planning for the attack was discussed at the Kuala Lumpur al-Qaeda Summit shortly after the attempt, which was held from January 5 to January 8, 2000. Along with other plotters, it was attended by future September 11 hijacker Khalid al-Mihdhar, who then traveled to San Diego where he established a close relationship with "9/11 imam" Anwar al-Awlaki, who was later linked to numerous plots and attacks, including the Fort Hood shootings and the "underwear bomber" of 2009 and put on a targeted killing list by President Obama as a terrorist threat. On June 10, 2000, Mihdhar left San Diego to visit his wife in Yemen at a house also used as a communications hub for al-Qaeda. After the bombing, Yemeni Prime Minister Abdul Karim al-Iryani reported that Mihdhar had been one of the key planners of the attack and had been in the country at the time of the attacks. He would later return to the US to participate in 9/11 on American Airlines Flight 77, which flew into the Pentagon, killing 184 victims.